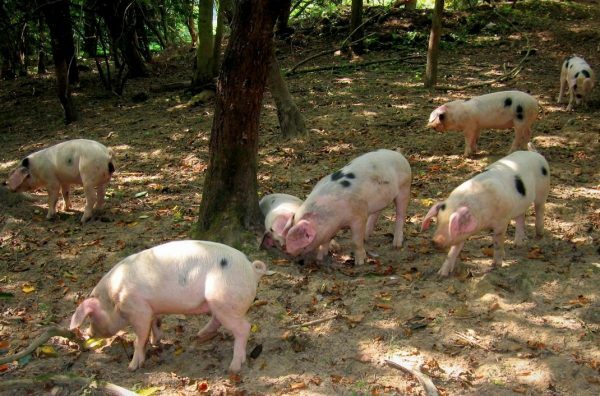 Working with Stepney Hill Farm we will trial the use of pigs to improve the woodland floor in Row Brow Wood. A section will be fenced with the assistance of Scarborough Conservation Volunteers to hold the pigs. When the weather permits six or seven piglets will have the woodland floor to forage in. The theory is that the pigs will turnover the deep leaf litter and topsoil to create an opportunity for new growth and for dormant plants and seeds to bloom again. This project will be monitored closely for the wellbeing of the pigs and the woodland floor. Look out in Spring 2019 for more news on this project. To watch a video click here. Stepney Hill Farm are also offering an opportunity for the community to get involved in growing our own stock of trees for the future. 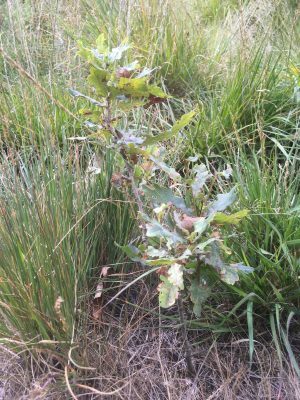 It is proposed that a block of land running under Row Brow be fenced against deer and this autumn families, school children and volunteers collect acorns, beech masts, sycamore seeds, hazel nuts, rowan and hawthorn berries to plant our own tree nursery. If you want to collect your own acorns and seeds to plant at home with your children and watch them grow, let us know and we can plan for you to bring them to the woodland. In two to three years time you can bring them to the woodland to plant on and then watch your tree mature over the coming years. Work has already commenced to create a fenced area in a block of pasture land beneath the foot of Row Brow Wood. Scarborough Conservation Volunteers have helped clear several trees and bushes in preparation for the fencing off. Wood from the felled trees has been trimmed for posts and further work will be undertaken to fence the area ready for the planting. If you have a question or would like to know more Contact Us. 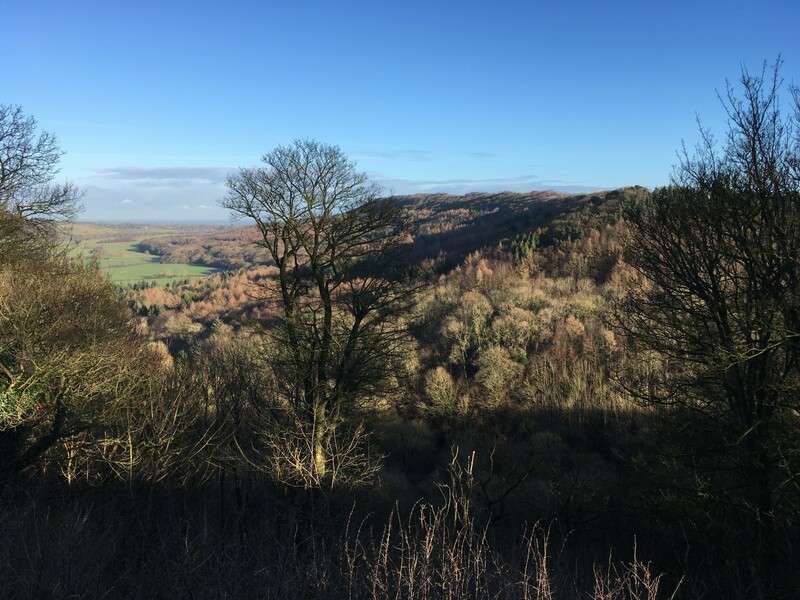 If you would like to get involved with the Scarborough Conservation Volunteers (ConVols) or learn more about them you can visit their Facebook page or read our article about the work they have undertaken in Raincliffe Woods, Forge Valley and Row Brow this year. In the next few years the woodland will change dramatically as Ash Die back disease has taken hold and this is most noticeable in Forge Valley. 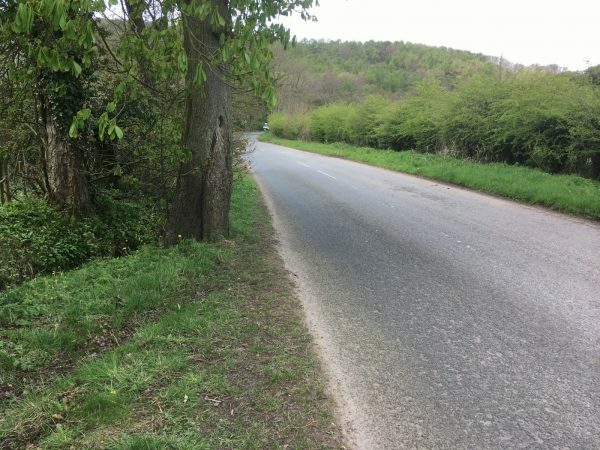 With the number of ash trees with the disease we will soon see gaps appearing in the tree cover along the valley and roadside. The autumn seeds we collect now and plant this year will be ready to fill the gaps in the tree cover in two to three years time. The government have plans for a Forest of the North from Liverpool to Hull requiring 50 million trees to be planted. It is likely there will be a shortage of native grown trees for planting in the coming years so by growing our own we can ensure we have our own stock for the future. If you have an interest in getting involved in this project Contact Us. If you would like to know more about the Forest of the North the Woodland Trust have a an article on the proposed forest. At the end of May this year we submitted an Expression of Interest (EoI) to the Rural Development Programme for England (RDPE) Growth Programme for Tourism. The money for this programme has come from the European Union and is directed at promoting and sustaining the rural economy. 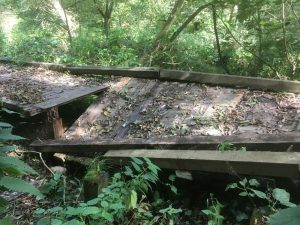 The EoI was for funding to improve the Boardwalk in Forge Valley. The Boardwalk is coming to the end of its safe life as a significant number of timbers are now starting to fail. 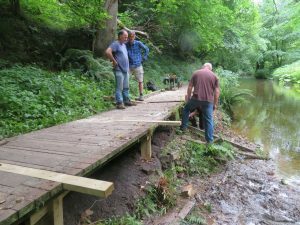 The original installation of the boardwalk was undertaken by the Scarborough Conservation Volunteers and they have continued to provide teams to help with the maintenance along with North Yorkshire Moors National Park volunteers. Continuing to repair sections is becoming unsustainable and if nothing can be done the Boardwalk may have to be closed and removed for safety reasons. We are very pleased to announce that our EoI has been accepted and now the serious work starts in pulling together a Design & Specification for the project and to submit a Planning Application. If we are successful in our Planning application and also the granting of a permit from the Environment Agency, we will still have to wait to see if the capital for the project will be finally approved. The current plans are that we should hear around May 2019 if we can go ahead with the scheme and work commence in August 2019 with completion by no later than September 2020. The Boardwalk was constructed 18 years ago to provide a surface suitable for wheelchair users. Soon after construction it became noticeable that in winter the wooden boards became very slippy for able bodied walkers. To overcome the slippery surface chicken wire was pinned down but this became a trip hazard so this was removed and grit strips were pinned in place. While these have worked for able bodied walkers it has made the ride very uncomfortable for wheelchair users with a repetitive bumping. The boardwalk provides access to a woodland setting and Natural Nature Reserve and provides a valuable area for wheelchair users to explore a wonderful natural setting. RWCE are working with the Yorkshire Coast & Ryedale Disability Forum on this project and seeking their insight in to ensuring that the the project meets their needs. If you are interested in getting involved or have a question Contact Us. Access from the Scarborough end of the woodland at Throxenby Mere is also a key project and RWCE are exploring ideas around creating a new footpath / cycleway. This access would run gradually up from the Mere to the Middle Track where the Moors to Sea Cycle route joins from the Dog Bark Bend car park. This idea has been well received by all those we have had an opportunity to discuss with. Our focus is now on making this become a reality as well as encouraging the authorities to address the problem of the missing section of footpath from above the Raincliffe School gates up to the Mere. With no footpath and a bad bend it does not encourage people to arrive on foot or families with children on push bikes or in pushchairs. We believe this has to be greatly improved to ensure that access to the woodland is not just for those with a car. If you have a question or would like to know more Contact Us. All these projects require funding and this years felling programme will provide some of the money required. 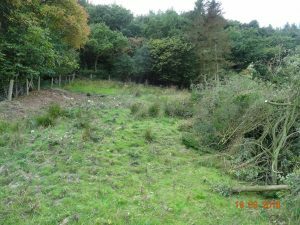 Felling will commence in early October and after the dry summer and hopefully dryish September we will keep disturbance to the woodland floor to a minimum. 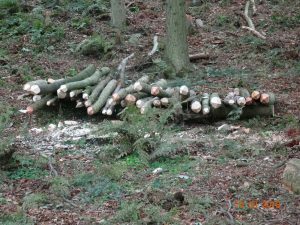 This year we are using the skills of two local foresters who will be using chain saws and not mechanised felling equipment to take down the trees. Much of the extraction will be using winches to pull to a collecting point and then loading on to a trailer to take on to the Sawmill site. Collection and transport will be through a local haulier and taken the short distance to Flixton Sawmill for processing. We are very pleased that this year we have been able to work with local businesses and are looking to build on this local relationship. We will be installing Digital Surveilance systems around the sawmill site during the storage and collection of the felled timbers for security and safety reasons. The map below shows the area of felling and where contractor vehicles can be expected to be working. Notices will be displayed on tracks and pathways to raise awareness for woodland users. After the felling work has been completed restoration work will commence to the woodland floor and tracks. 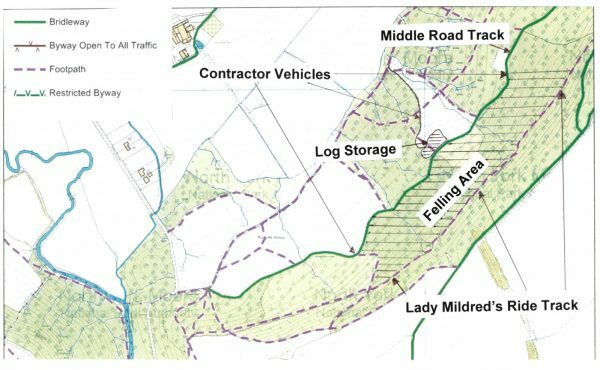 Felling trees in the woodland has been questioned by some and a report produced by Natural England on the importance of Raincliffe Woods & Forge Valley may help understanding. This report underpins all our plans in terms of the felling and restoration of the woodlands. If you have a question or would like to know more Contact Us.